In 2016 I was selected as one of thirty artists for the #ThirtyForThirty Art Competition run by Buro4 a specialist project design and development management company. Celebrating 30 years in business, Buro4 selected 30 artists to take on a past project of theirs and respond by creating a specific art work. The works were shown at the National Theatre Gallery and at Buro4’s Headquarters. With the production of a publication to accompany the Prize. You can view the book here. It was a great opportunity and I was given a local Foster + Partners building, The Folkestone Academy. You can view how the site visit went here and #workinprogress photos here. When hung in Buro4 HQ in central London, it was if it was created specifically for the space and so thought the staff and chairman who ended up buying the work. 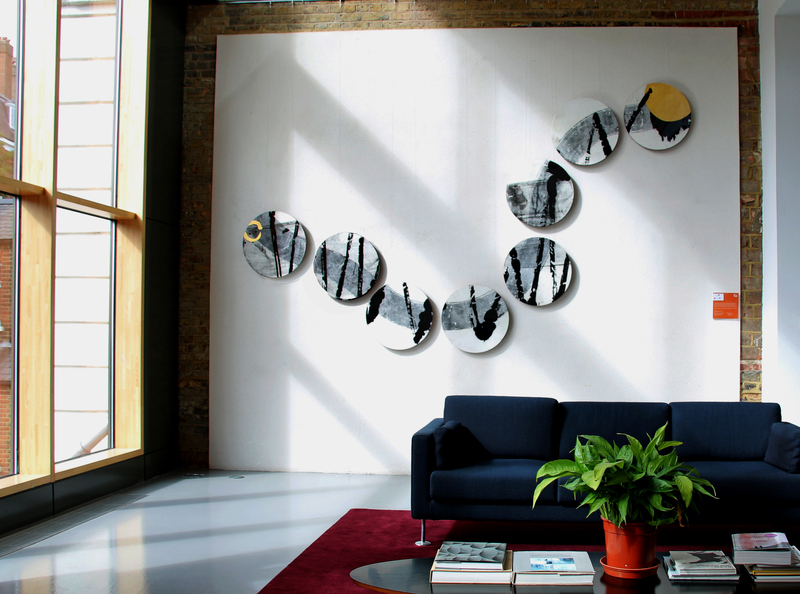 ‘It Starts With You‘ is a large Indian ink painting on several layers of Chinese mulberry paper across 8 wooden discs. These are suspended away from the wall in an open curve. The circle and plywood references the 8 three storey House pods of Folkestone Academy. The work started as a large single brush stroke circle and transformed into the fluid curve. A solitary open gilded form, an enso circle, can be seen at the left hand side. The flow of a thick brush stroke guides the eye from the gold circle through a downward sweep and up toward a higher exit point and a solid gold shape. Across the path of this sweeping mark other lines intersect at angles, coming into and off the curve, creating a dynamic. A sightline can be drawn diagonally across from the start to the finish and beyond. But rarely does any journey follow a straight line. Reminded of snakes and ladders there are set backs along with moments of great achievement. The work references the architectural footprint and materials pallet of the Folkestone Academy along with the embodied philosophy of child centred life long learning. Equipping the students with the skills and knowledge to set and achieve realistic scholastic and over arching life goals. Nurturing them and raising aspirations, to become individual catalysts for change within the community. For a young school, it has achieved much. It is held in high esteem up upon the hill where it sits. First generation school leavers have entered higher and further education, cabinets full of trophies for individual and house success are all testament to this. So whilst I may have placed a ‘trophy’ on the top right of my image it starts with believing in, in valuing and gilding the individual. I have undertaken direct private commissions for work to go in either home or corporate settings and aboard luxury cruise liners. If you would like to know more about the commissioning process. Please use the contact form.